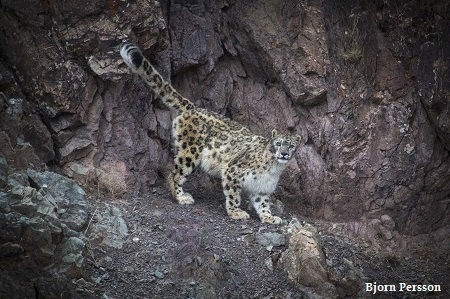 The May 2017 Conservancy newsletter featured two wildlife photographers, Bjorn Persson and Oriol Alamany, and the world of the snow leopard as seen through their eyes. Read their amazing stories and share their personal experiences as they successfully search for and film the elusive snow leopard! 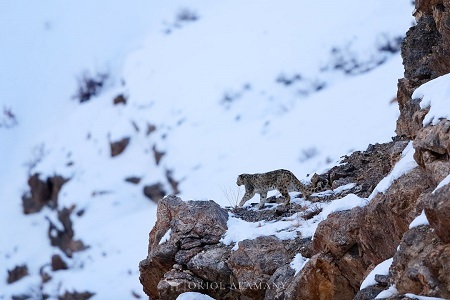 Recently, Persson traveled to a completely different, yet equally beautiful and delicate ecosystem, that of Ladakh, India, located in the Karakoram mountain range, one of the Greater Ranges of Asia, to photograph snow leopards in their natural habitat. And this is his story. 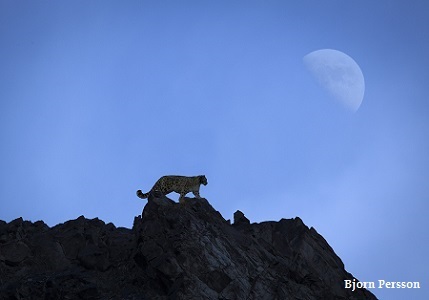 I was blessed to take these photos on a snow leopard expedition to the Hemis National Park in Ladakh, India. I say blessed because if you’re extremely lucky, your only chance of seeing one is through a telescope one kilometer away. Snow leopards are one of the world’s most elusive animals, and the most common way to spot one is high up on the mountain ridges where they like to patrol. This is also what happened the day I first saw one. 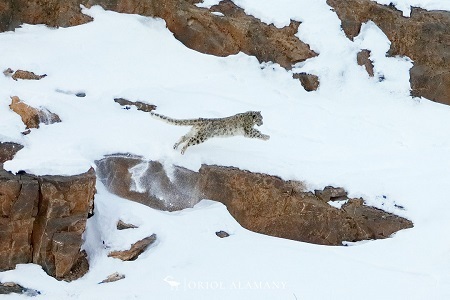 After several days of patiently waiting (and freezing), we finally spotted a snow leopard passing by on a remote top. Just the sensation of actually having seen this mysterious ghost of the Himalayas was an unforgettable experience in itself. But I wanted more. Somehow I just felt that this was the day I had been waiting for my whole life. When it finally disappeared over the ridge, I asked the guide if it was a good idea to trek to the other side of the mountain. He said no. It was already getting dark, and most likely it would be gone by now. But the voice in my heart told me otherwise. I decided to get to the other side on my own. Deeply concerned, he explained that it was on my own risk, but before he’d even finished his sentence, I was gone. One hour later, and after a steep, strenuous climb up the mountain side, I lay down on the ridge to wait. Below me was a valley with some grazing blue sheep. I looked around through my binoculars but couldn’t see a thing. The sun was going down and my whole body was shivering from the icy winds sweeping through the gorge. Another 30 minutes went by, but nothing. I was just about to give up when I suddenly discovered that the blue sheep had frozen in their positions. Their ears pointed straight up and they were all looking in the same direction. My heart started pounding. I still couldn’t see anything, but now I knew it was there. 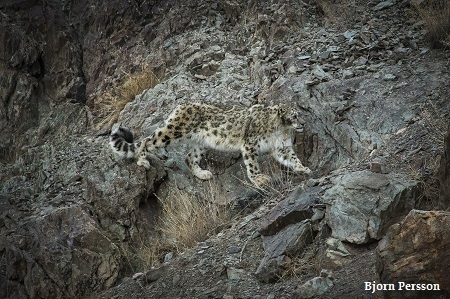 Suddenly, a big dust cloud appeared before my eyes and out came the snow leopard. He was going after the sheep, and in blind panic they started running up the hill straight towards me. Some of them passed so close they almost tread me down. The hunt was over in a few seconds, and when the leopard realized it wasn’t his lucky day, he stopped and started to make his way up a mountain in front of me. At this point, the distance between me and him was less than a hundred meters. But despite my big, red down, he didn’t seem to notice me. Peacefully, he just walked up the side of the hill, sat down, and started overlooking his territory for other prey. I couldn’t stop taking pictures. It was the most beautiful thing I had ever seen. But after a while, I put my camera aside and just observed him. The moment was too good to be experienced through my lens. It was just me, him, and the mountains. A lot of people talk about religious experiences. This was as close to one as I’d ever been. It was almost like he had come to me, not the other way around. And somehow it felt like he now rewarded my determination by leading me to him. Oriol Alamany is a photographer from Barcelona, Spain. An enthusiast of nature, photography, and film since childhood, he studied biology and graphic design. In the 80′s, Alamany shared the work as a naturalist, specializing in mountain fauna, with graphic design, cinema, and photography. He finally established himself as a professional photographer, having published in magazines such as National Geographic Spain, BBC Wildlife, Terre Sauvage, Geo, Lonely Planet, etc. He also has written and illustrated several books. After three trips to the Himalayas, my wife, Eulàlia Vicens and I decided that the time had come to attempt a photographic work on the elusive snow leopard, our dream subject. We spent a lot of time studying the potential locations, and in February 2017, we traveled back to the Himalayas. It is not easy to get around these mountain ranges in winter due to the cold (0 to -30ºC), the altitude (4000-5000 meters, 13000-16500 feet), and the poor conditions of the roads, accommodation, and food. But working together with local naturalists and trackers, we had the privilege of watching and photographing three different snow leopard specimens, sometimes for hours. The second of our sightings was particularly outstanding. After several hours of walking and waiting around 4100 meters (13500 feet) on the snow at dusk, we were able to observe one snow leopard trying to kill a Siberian ibex, Capra sibirica. 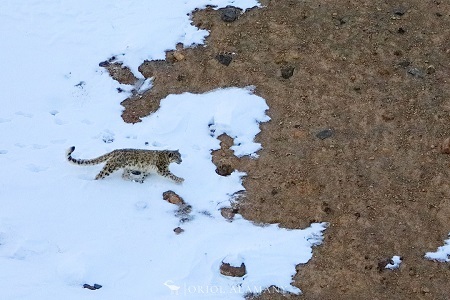 At first, the leopard was studying the ibex herd for a long time, taking advantage of the camouflage provided by a few brown earth patches in the totally snowy mountain slope. 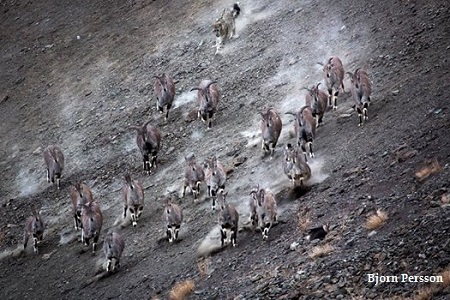 After half an hour of patient stalking, he ran through the deep snow behind the ibex, who fled in terror until jumping over the vertiginous cliffs, with the leopard behind them. For an instant we thought that all had died falling into the void. But after some minutes, the leopard and the ibex reappeared safe and sound. The kill had failed. Throughout the evening, the attacks were repeated twice more without success. I was shivering, maybe by the intense cold, maybe by the excitement. As a wildlife photographer it was a thrilling experience, and as a naturalist an interesting behavior observation.